When I was little the library was such a magical place. There were literally thousands of new adventures waiting for me in all those books and I could even take them home with me (well, a few at at time). I’ve always taken my kids to the library from a very young age and here are seven reasons why I think you should too. Going to the park is lots of fun for the kids and gets them running about in the fresh air and sunshine while working on those gross motor skills, but day after day it can become a little tedious for you both. Activities at home are great too of course – like craft, cooking and playing with blocks – but if you want to actually leave the house then the library is a fantastic alternative to all your usual go-to places. The library is full of new and exciting books, plus colourful reading nooks, posters and toys – what child wouldn’t love that?! Fun aside, it’s also educational. Reading to kids and exposing them to more books from a young age has been proven time and time again to be so valuable in developing their literacy skills, fostering imagination, broadening knowledge by feeding inquisitive minds and encouraging more conversations. It’s never too early to get your child obsessed with books and the library is a great place to start! Most libraries hold mum and bub classes where you read books to your babies in a group setting with a library staff member guiding the session. Usually there are classes for different age groups, starting from six months through to preschool age (up to six years of age), and they’re completely free! It’s a nice way to meet other local mums and for your child to make friends, especially if they don’t go to daycare. While it’s fantastic to have lots of books on hand at home, it can get expensive if you’re constantly buying new books every week. Which is why the library is so good, because they’re totally free (unless you’ve reserved a book in which case you might be asked for the measly sum of $1). You’ll often discover exciting titles you wouldn’t normally come across. And it’s not just books on loan either – you can also borrow DVDs, CDs, audiobooks, and sometimes even toys, games and puzzles. How good is that?! Curling up with your little one on a bunch of cushions in a corner reading quietly while surrounded by hundreds of books – is there anything cuter? Shopping centres, parks and play centres are so loud and noisy, but in contrast the library is quiet and peaceful. Going there together really is a special and intimate activity. The library introduces children to the act of borrowing and returning items which aren’t theirs. It’s incredibly exciting for them to produce their card and help scan the books, and then post them in the return box when they next come back. It’s also a nice way for them to learn about looking after other people’s property carefully and taking more care of their own books in general too. Learning about playing and talking softly when at the library is a good way for them to practice treating people and places with respect too. Going to the library is an ideal activity for anyone to do with your child, and not just yourself or your partner. Grandparents might find the park or a play centre too physically challenging and noisy, but the library is just up their alley. It’s also an easy option for nannies and babysitters, and perfect for bringing younger and older siblings too. There’s something for everyone at the library! 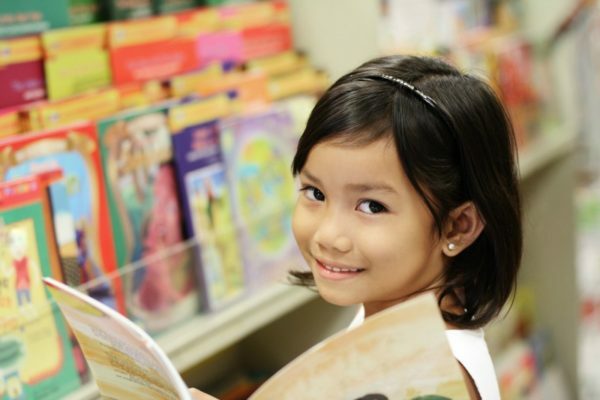 Do you love taking your kids to the library? What do you love most about it? Tell us on Facebook!